We live in an era where new technologies pop up quickly, and disappear just as fast. Everyone is always looking for the next awesome app that’s going to make their life a little easier, and a little more fun. Although live streaming video has been around for a while, it is beginning to gain popularity and traction, and some new live streaming apps have appeared in the last few months. Here’s a quick run-down of our favorite apps and websites, and how you can use them to promote your music, connect with fans, and even earn some cash. There are lots of different services that will allow you to stream a show live. 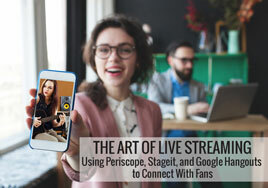 UStream, Livestream, and Stageit are platforms that can put your concert directly onto your fan’s laptops. But Livestream and UStream are expensive to use. There is also live commenting enabled for fans and artists so that you can interact with viewers during the show. You will also have access to information about the fans who tip the most during your show, and Stageit encourages you to give fans that tip generously a reward, like a signed CD or poster, when the show is over. Stageit is available on mobile platforms as well as desktops and laptops, so your fans can watch from anywhere. All you need to get started is a webcam, but you can upgrade to a more complicated set up with more cameras and different audio sources if you like. There are two downsides to Stageit. When you use Stageit to live stream a show, nothing is recorded and archived. This is a great thing to promote the exclusivity of the Stageit show, but it can become a problem if something great happens and you have no means to capture and keep the video. Stageit also uses their own “currency” during shows called notes. Fans pay for show tickets and tip during the show with notes that they pre-pay for. One note is equal to 10 cents, and fans can purchase them when they sign up for the site. While this isn’t a bad system, it can be a little confusing for new users, so you may want to explain it to your fans before your show. If you want to get into live streaming shows, Stageit can be a powerful tool to connect with fans, and put a little extra cash in your pocket. Twitter’s newest app launched in March 2015 and it’s beginning to pick up a lot of buzz. Periscope is a social app that lets your broadcast live wherever and whenever you want. You simply login with your Twitter account information, give Periscope access to your phone’s camera and photo roll, and you’re good to go. Then other users can tune in to what you’re broadcasting live. There are a couple of features in Periscope that help it to stand a little above its main competitor Meerkat. Privacy Settings: You can allow anyone to watch your Periscope broadcasts, or you can invite specific users in. This is a really cool feature if you are offering a live broadcast as a reward to fans for a crowdfunding campaign, or if you only want members of your fan club or patrons to see your broadcasts. Video Archival: Periscope lets other users see your broadcasts for up to 24 hours after you post them, a feature that Meerkat doesn’t have. It also gives you the option to save all your broadcasts to your phone. This means that your Periscope broadcasts are doing double duty capturing video that you can use later for YouTube or Facebook. Periscope can help you communicate directly to fans like never before. People who love your music can experience moments with you as they are happening, and they can interact with those moments. Periscope displays comments in real time during your broadcast so users can communicate with you directly and affect what’s happening in your broadcast by giving their suggestions or asking questions. This is a fantastic way for artists to deepen their communication with fans. Google+’s live streaming feature is a great choice if you want your live stream to be recorded and archived, and if you want a little more flexibility in where your users can watch from. Since Google+ and YouTube are best friends(i.e. owned by the game company! ), your Google+ Hangout On Air can go directly to your YouTube channel, and will be archived there. Live streaming with Google+ is also embeddable, so you can place the video into your website. This is a great way to encourage your fans to visit your website. Google+ Hangouts On Air are simple to set up (you can find instructions here). If Google+ isn’t your cup of tea you can set up your live stream directly through YouTube (click here for details). They function essentially the same, although on YouTube fans will only be commenting, not engaging through video. You can also earn money for ad revenue during live broadcasts through YouTube if your channel is set up for monetization. Having a dedicated set of fans is the number one key to having a successful career in music. Giving your fans custom experiences through live streaming can help you strengthen bonds with existing fans, and open doors to creating new ones. And when fans are engaged with you and your music, you are one step closer to a sustainable music career. Have you used live streaming before? How did fans react? Will you use it again? Let us know in the comments below!